He waited by the door with his black sneakers and Lightning McQueen back pack in his hands. He looked so handsome in his matching Lightning McQueen T-shirt and black shorts and hair combed. His eyes danced. 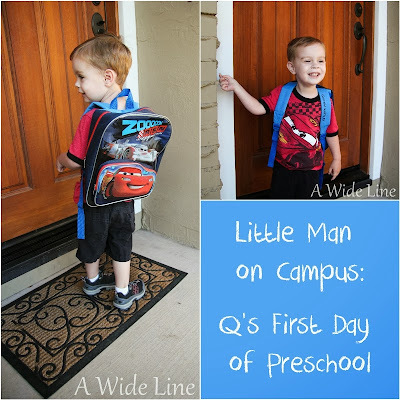 My usually pokey toddler – the one whom I normally have to prod out the door as every shiny thing distracts him along the way – couldn’t get to his first day of preschool fast enough. Quinn urged, “Drive faster, Mommy” all the way there. We arrived a little too early, and my antsy child bounced all over the waiting area. When the teachers opened the classroom at exactly nine-o’-clock, he shot through the doorway like his bum was on fire. He was so happy to explore everything, he barely glanced at me when I kissed him goodbye. The night before, I had a good cry about my baby boy starting preschool. And when I saw him the next morning with his backpack on, he appeared so much older than two-and-a-half, and it was Mommy who had to put on the brave face, not Quinn. I thought for sure I would lose it when I dropped him off on his first day, but after seeing his excitement, there was no way I could be sad. I didn’t cry at all. Not even in the car on the way home. Instead, I beamed with pride and optimism. Just like sleeping in his Big Boy Bedroom, it seemed like preschool would be yet another easy transition for the Q-Man. I may have gotten my hopes up too soon. The novelty and excitement of preschool lasted a couple more days, but it quickly started to wane. Q has transitioned back to his pokey self in the morning. He still goes willingly into the classroom, but the first-day enthusiasm has vanished. He doesn’t cry when I leave like a couple of the other kids do, but he’s definitely sad. He won’t hug or kiss me or tell me goodbye. He just plays at the sensory table not looking at me as I kiss his cheek. Knowing Q's sad and I have to leave him there just about kills me. I worry about him all morning, wondering how he's feeling at any given moment. Instead of enjoying my few hours "off" twice a week, I count the minutes until noon when I can go get him and see if he's okay. His teachers tell me that Q gets sad at several points during the morning and asks for Mommy, but they assure me that it’s normal and he’s not the only child in the class who needs occasional comforting. They read to him or distract him with an activity, and they sing the “Mommy Song” to him, which made me tear up when I heard the words. One of his teachers says he sticks to her like glue. She’s petite with blonde hair, and I wonder if he feels safe with her because she looks like me. Quinn’s gotten into the PBS show Daniel Tiger’s Neighborhood (based on Mr. Rogers’ “Neighborhood of Make Believe”), and the lessons really seem to stick with him. He talks about it for days after he watches the show, so I played the “Grown-Ups Come Back” episode where Daniel gets dropped off at school and doesn’t want his daddy to leave. We talked about the show all evening. I explained to Q that when Mommy or Daddy leave for a little while, he’s always with someone who cares about him very much and that Mommy and Daddy always come back. “Yeah!” he said with a smile. “Mommy always comes right back.” He seemed content with that knowledge. “Yes, I do. Always,” I assured him. “I cry about you, Mommy,” he said. I wiped my silent tears in the dark and held my baby boy close. He no longer seemed older than two-and-a-half. I thought starting preschool before his baby brother arrived would be a good thing for Q. I had hoped preschool would be his thing that was just for him, a happy constant that would remain after the baby comes, providing comfort and familiarity during a potentially tumultuous and confusing time for him. I had also hoped preschool would lead to a healthy separation and independence (for both of us), but it seems as though it’s having the opposite effect. Everyone assures me that this is just a phase. Hubs says Quinn needs time to adjust. The teachers say this is common at the beginning of the school year and that most children are completely over it before the holiday break. I hope they’re right. Until then, I'll cry about Quinn, too. There is such a strong bond between a mother and her son.....and those tears will still be there when he gets on the bus for the first day of kindergarten, middle school, high school, and college. It is so, so hard to let our babies go, even though we know that it is good and healthy and all of that! Quinn will adjust, I am sure! And you will too! I'm not sure how I stumbled across your blog a couple of months ago, but this post makes me especially glad I did!! I'm currently pregnant with our first, who is also a little boy. Me in my emotional weepy state really cried at this post, but in a sweet "I can't wait to be a mommy" way. Thank you for sharing your life with fellow moms and moms-to-be.